We recently received a new cookbook, The Adventurous Vegetarian: Around the World in 30 Meals by Jane Hughes, and there are so many dishes in it we've never even heard of -- how fun to be surprised! It's a collection of recipes representing what vegetarians from all around the world eat. So...what to make first? Avocado Ice Cream from Mexico? Honey Cake from Russia? Mung Bean Pudding from Vietnam? Coo Coo with Spicy Tomato Relish and Plantain from Grenada? It was pretty hard to decide. Sounds like this book's going to expand our horizons since people all over the world eat great vegetarian food. 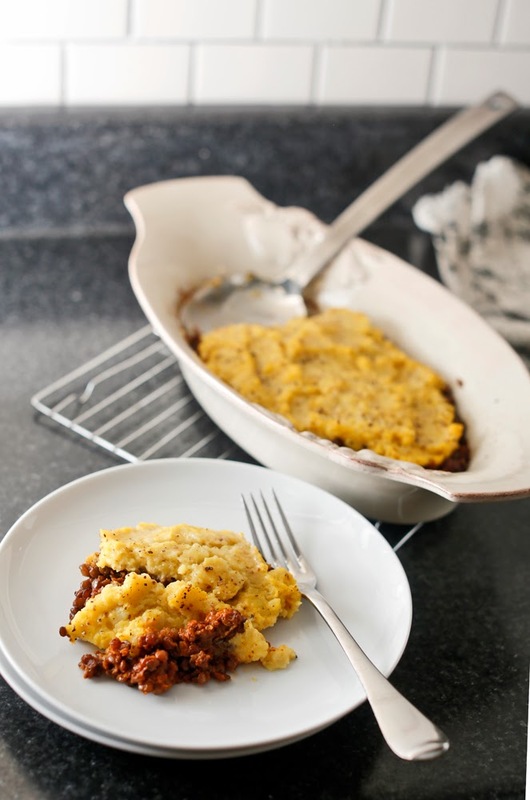 We settled on first making Shepherdess Pie from New Zealand, and it turned out to be a super-quick dish with just two components: a brown lentil base and a spicy mashed potato topping. Here it is -- give it a shot one weeknight when you only have a little time but you're still dying to cook. And be sure to check out Jane's book; click 'look inside' HERE to see all the great stuff listed in the table of contents! Preheat the oven to 300 degrees. Cook the lentils in the water for around 30 minutes or until soft. Drain if there is any water left. Transfer the lentils to the mixing bowl and mix with the remaining base ingredients. In another bowl, mix all of the topping ingredients together. Put the base mixture into a shallow oven-proof dish, smooth out, and top with the potato mixture. Bake for 30 minutes until browning and crisp.